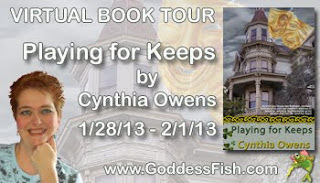 Today Love Saves the World welcomes Cynthia Owens who is currently on a book tour for her book, Playing for Keeps. LStW: Hi, Cynthia! Playing for Keeps is the third book in your series. Can you tell us more about the O'Brien family? Cynthia: In Sunshine or in Shadow, the first book of the Claddagh Series was born from an idea of a small, wind-swept west-of-Ireland village. I’d pictured the village in my mind for a long time – the wild seas, the lush green and brown of field and bog and wood, the ever-changing skies, and I named it Ballycashel (town of the castle). I “knew” Rory O’Brien, my hero, too, knew his secrets, the deep pain he kept locked within him, and his driving need to protect his little daughter and fashion a good, decent life for her. I just had to find a heroine worthy of him, and I found her in Siobhán (pronounced “Shivaun”) Desmond. Siobhán is a valiant survivor of famine and tyranny who will risk everything to keep her family alive – even if it means working for Rory, who’s set himself up as the landlord of Ballycashel House. Gambler and survivor. Landlord and tenant. Their love couldn’t be denied. 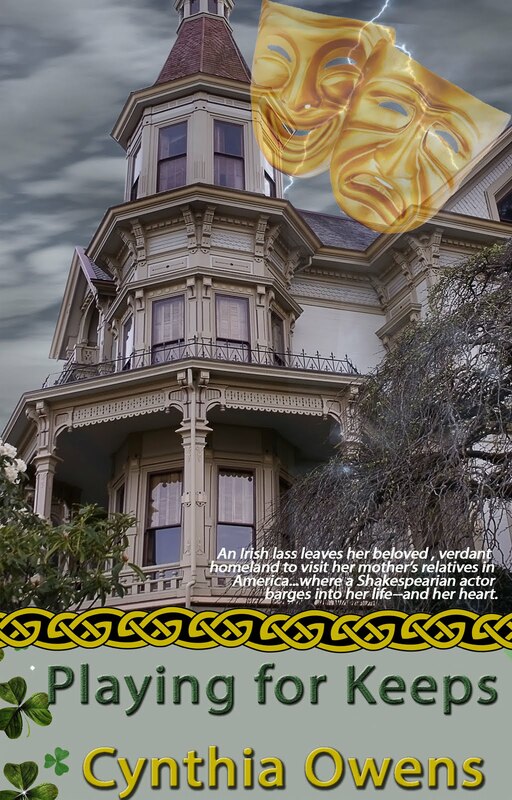 In Coming Home, Book II, Siobhán’s daughter, Ashleen, returns to Ballycashel after a year in America, eager to see her family again and embrace her old life in Ballycashel. On the voyage home, she meets Cavan Callaghan, an Irish-American war hero in search of the family he’s never known. But the memories of that savage war and the loss of his young brother on the battlefield continue to haunt him. It’s up to Ashleen to show him that you can find a home and a family in the most unlikely place. Playing For Keeps marks a turning point for the series. With this story, I’ve taken Rory’s daughter, Katie, away from the cozy, comfortable Irish home she’s known since she was a child. I’ve sent her to Baltimore, and thrust her into the genteel world of her mother’s family. She’s totally alone with people who might not be as anxious to meet her as she was to get to know them, and it was interesting to see her reactions to her aunt and uncle, and her two cousins. LStW: Do you plan to write more stories about the family? Cynthia: I plan to write several! I’m already working on Shannon Flynn’s story. She’s a close friend of the O’Brien family, and cousin to Cavan Callaghan. A reader recently asked if I was going to write a story for Sean O’Brien and his journey in America, so I’ve been thinking about that, too. My editor expressed an interest in a story for Katie’s young cousin, Lissa Thornhill, and despite her handicap, I think there’s a love story in her future, too. Another reader wants to know what happened to Deirdre O’Brien when she grew up, and then there’s Thomas O’Brien, and Fiona Flynn. I love the people of Ballycashel! LStW: What attracted you most to writing historical romances in the Irish setting? Cynthia: I’ve always been an armchair traveller, and I love the way a good historical romance can not only transport me to another place, but another time. Whether it’s a Medieval Scottish castle, the drawing rooms of the ton, or a chateau in France on the eve of the Revolution, I love a story that can draw you into another world. As for my Irish setting, well, I’ve been in love with Ireland, and all things Irish, since I was a child. I love the music, the myths and legends, the people … everything about Ireland. And of course, Ireland’s history, so filled with tragedy and perseverance. Few people have endured so much, and emerged stronger for their grief. On a side note, a few years ago I was positively thrilled to learn that I had an Irish ancestor on my late father’s side. I’m proud to claim even that one small drop of Irish blood! LStW: Any upcoming projects that you would like to share with our readers? Cynthia: I have a few new manuscripts on my laptop. One of them, the first in a new series, is on my editor’s desk right now. The series revolves around the lives of five Irish-American friends who met on a coffin ship as boys, grew up in New York’s Five Points, and fought together in the American Civil War with Thomas Francis Meagher’s Irish Brigade. 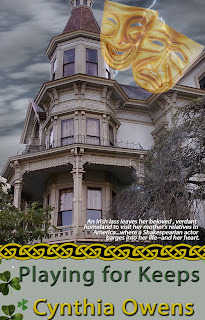 I’m also working on Book IV of the Claddagh Series. Shannon Flynn At the moment, I’m working on Shannon Flynn’s story. Since Shannon’s shy, tentative romance with Mike Donavan in Coming Home, she’s had a lot of heartache. Can a mysterious stranger with burnt-cinnamon hair and sea-mist eyes bring her the joy and fulfillment she deserves? Congratulations on the release of Book III and Good luck with Book IV, Cynthia! to add to the theatre’s coffers. Great interview and excerpt. thank you. Welcome to my blog! Thank you for stopping by! Thank you for helping me welcome Cynthia! Thanks for having me, Tin, I enjoyed answering your questions. I love finding new romance by new authors! I finally found magnificent post here.I will get back here. I just added your blog to my bookmark regions. thanks.Quality presents is the fundamental on welcome the visitors to visit the webpage page, that is the thing that this site page is giving.Wants to know about Bernie Mac wife? Visit our website.